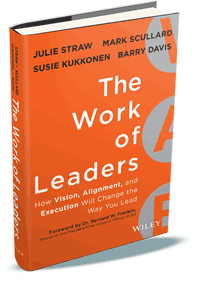 Everything DiSC Work of Leaders® provides leaders with a personalized strategy for leadership success. The personalized leadership report is perfect for leaders in any industry at any experience-level. Learn more about your leadership style and improve your effectiveness as a leader with our comprehensive Leadership Development Assessment tool. The assessment is commonly used for executive coaching, for leadership development or for career development programs. An online user-friendly leadership assessment built around employee behaviors at work and their leadership preferences. After completing a short assessment a detailed narrative report is returned containing detailed information about leadership styles, characteristics, priorities and vision. The report is generated using leadership best practices and the official DiSC circular model. The Everything DiSC Work of Leaders Profile provides the respondent with a DiSC-based leadership-specific color report. This group report is based on participant results from the Everything DiSC Work of Leaders profile. 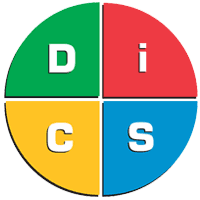 You will receive a summary of your participant's DiSC styles and how the participants relate to each other. The report also presents issues to consider for improving the work environment. The names and DiSC styles of each participant are included. If would like a report that keeps participant names anonymous, consider the Work of Leaders Group Culture Report. This report is based on participant results from the Everything DiSC Work of Leaders profile. 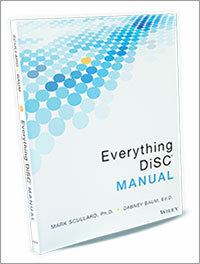 You get a summary view of the participant's DiSC styles and how they impact your organization's culture. 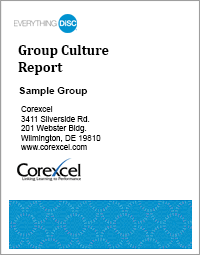 This report helps determine a group's culture and explore its advantages and disadvantages. It does not contain participant names but does include the percentage of participants falling within each DiSC style. 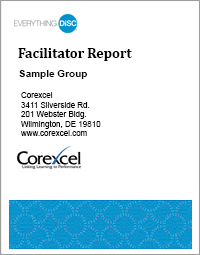 If you need a report with participant names consider the Work of Leaders Facilitator's Report. 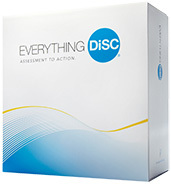 The Everything DiSC Work of Leaders Facilitator Kit provides everything you need to conduct a leadership training. It consists of five 60-90 minute training modules. Each module contains a fully scripted leader's guide, class handouts, PowerPoint presentation and video segments. All of the training materials are contained on a USB drive you can use to easily customized to fit the needs of your group. Everything DiSC Work of Leaders posters showcase the best leadership practices and include a DiSC model chart. They are great training enhancers in your leadership training sessions, or can be used as takeaways to leave with your clients. 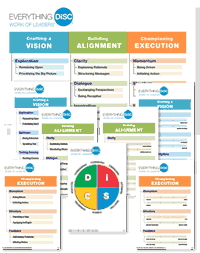 If you prefer to print your own, digital copies are included with the Everything DiSC Work of Leaders Facilitator Kit. 1:22 - Example video clip demonstrating ineffective leadership. 1:54 - Example video clip demonstrating effective leadership principles. Discover how Vision, Alignment and Execution will change the way you lead! Leadership is one of the most studied areas of organizational development. It is also one of the most requested topics for training. The Work of Leaders sets out to make sense of published theories and information about leadership. Discover this wealth of leadership insight to achieve better leadership results. Get the most out of your leadership profile! 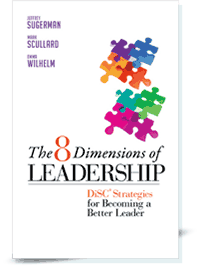 The Everything DiSC Work of Leaders Profile is based on the recently published, The 8 Dimensions of Leadership: DiSC Strategies for Becoming a Better Leader book. The book provides each leader with detailed insight on their strengths and weaknesses alongside lessons learned from other leaders of your style. You'll learn what you can do to become a more effective leader by understanding your style and the benefits of leadership flexibility. Get the most out of your Everything DiSC Work of Leaders profile by accompanying it with the The 8 Dimensions of Leadership. 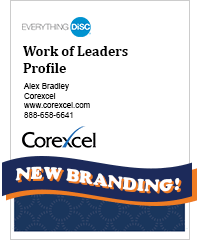 "Everything DiSC Work of Leaders" is a registered trademark of John Wiley & Sons, Inc.